Missing teeth pose a serious oral health problem that traditional dental treatments haven’t always been able to address entirely. Standard care for missing and extracted teeth via fixed bridges and full or partial dentures poses issues that can stand in the way of proper oral function, and even your confidence. At Pearly White Dental, Dr. Titi Dang and Dr. Krikor Simonian are dental specials who can help you solve the problems caused by missing teeth with dental implants in Huntington Beach, CA. Dental implants are a permanent way to replace teeth that have been lost or extracted due to severe damage or trauma. 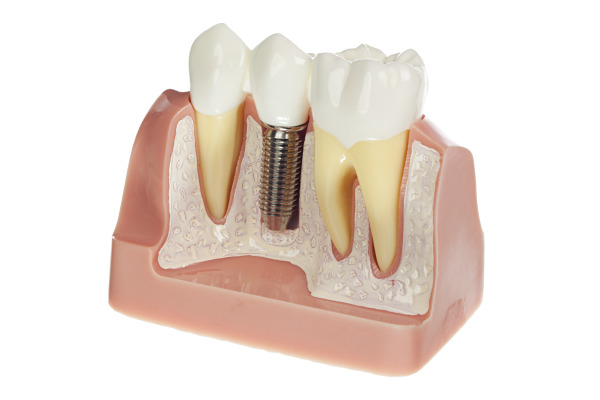 A dental implant is made up of a post, an abutment, and a crown. The post is made of titanium and acts as a replacement tooth root, so that your new tooth can be as stable as your natural tooth. The post is surgically placed and naturally integrates with bone in your jaw. This process, known as osseointegration, ensures that your implant is completely sturdy and is able to support healthy bone density by stimulating the area like a tooth root would. Once your implant post has had a chance to complete integration, Dr. Dang will create a custom-made porcelain crown that will sit on top of the implant’s abutment to finalize your treatment. Unlike fixed bridges and dentures, dental implants do not cause gum tissue shrinkage or require that healthy teeth be buffed down to accommodate treatment. Dental implants can also be used as anchors to support a denture, in order to restore an entire upper or lower arch of missing teeth. Implant-supported dentures provide a better fit and feel than removable dentures, and can return full oral function. • Made of titanium and fuse with bone in your jaw, preserving it. With proper oral health care, your implants can last a lifetime. At Pearly White Dental, we are dental implant dentists in Huntington Beach, CA who can help you achieve a confident, restored smile that functions just like it did when you had your original teeth. Before beginning any treatment plan, our dental team conducts a free consultation with x-rays to recommend the procedure that will work best for you. Ideal candidates for dental implants are non-smokers who have otherwise healthy gums to support their implant and promote quick healing. Our dental implant team consists of Pearly White Dental's primary dentist, Titi Dang, DMD as well as an implant and periodontal specialist, Dr. Krikor Simonian. Most dental offices have to refer patients to outside professionals in order to complete all components of dental implant treatment, but our Huntington Beach dental office has a trusted team of qualified dental professionals who are ready to help you find a permanent solution to dentures and bridges. To learn more about getting dental implants in Huntington Beach, CA contact Pearly White Dental to schedule your initial consultation. We make dental implant treatment easy by offering financing for your dental treatment!